It's summer time, which means we are slowing down a bit on projects so that we can soak up the sun and enjoy the outdoors with the kiddos. I still have plenty of projects to share with you this summer, but I'm going to fill in the gaps with a tour of some of the spaces in our home. We haven't even lived here a year yet, so most rooms are far from finished, but progress is part of the story, so I want to share where the rooms are now, and what my plans are for them in the future. 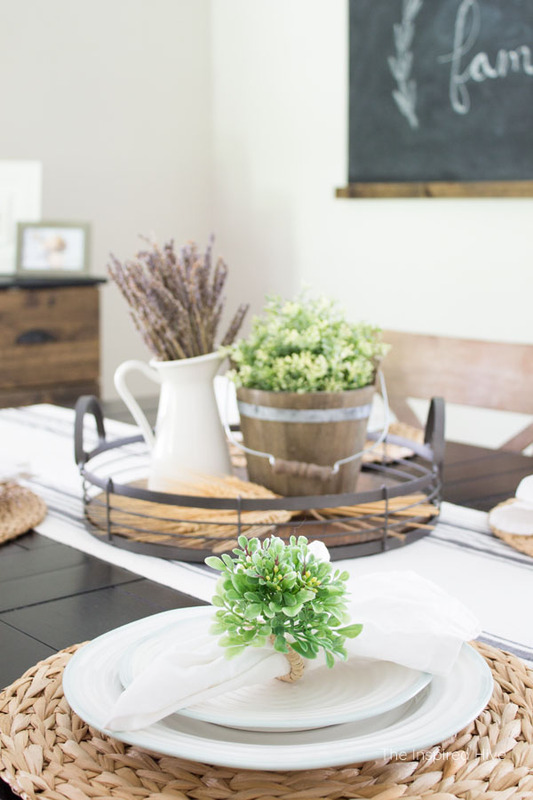 I've shared our dining room all dressed up for fall entertaining and Christmas dining. Today I want to show you what it looks like on an every day basis and tell you my design plans down the line. When we moved in last year, the dining room already had a neutral paint color on the walls. I might update it at some point to be just a bit brighter because this is actually a really dark room, but for now the color works just fine. The very first thing we did when we moved in was have our pine hardwood floors refinished from a golden orange color to a mix of Minwax Driftwood and Special Walnut. 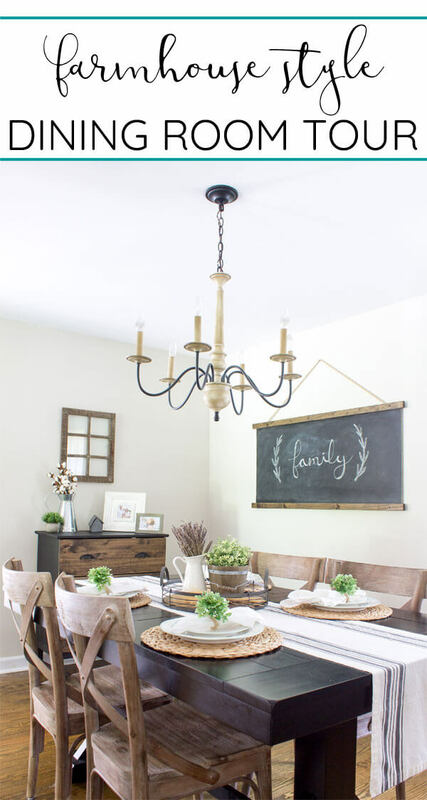 That big chalkboard on the wall is the focal point of the room. It's a great statement piece. I made it a few years ago with some really simple and affordable supplies. You can find the tutorial here if you want to make your own. Next on our agenda was changing the light fixture. It had a really cool hammered metal light fixture, but it didn't do a great job at actually lighting the space. We could hardly see each other over meals! 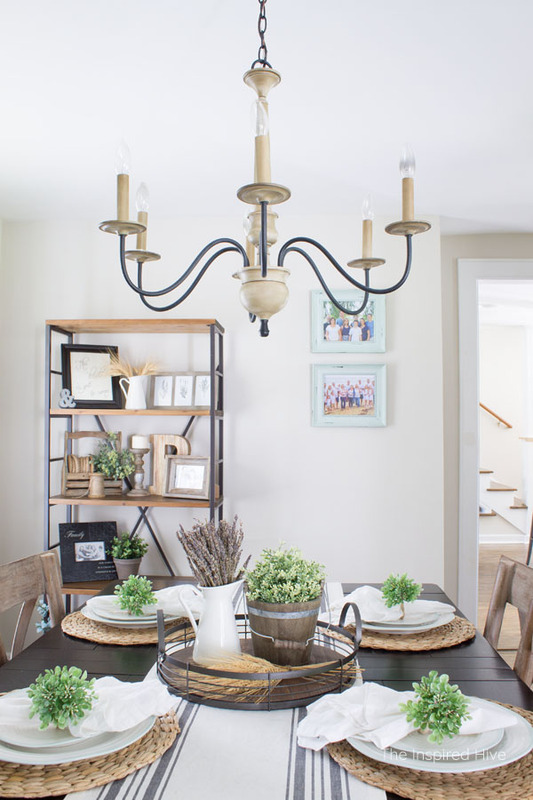 I searched everywhere for the perfect chandelier and fell in love with this one that is painted to look like wood. 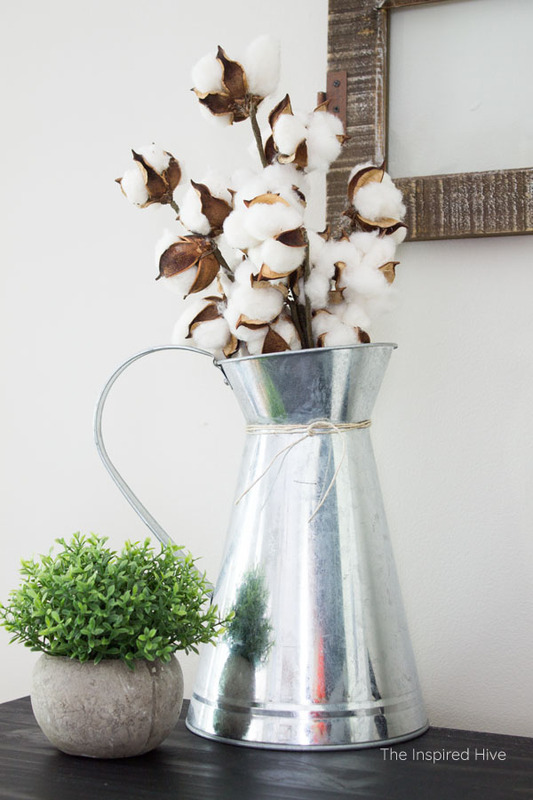 As a centerpiece, most of the time this metal and wood tray sits on the table with a pitcher of dried lavender, a faux plant, and some dried wheat. I found this tray at HomeGoods several years ago. I love that it doesn't take up too much space and I can easily switch out accessories with seasonal decor. These dishes are one of my favorite things I own. I fell in love with them when we were registering for wedding gifts. They are from the Sophie Conran Portmeirion collection. 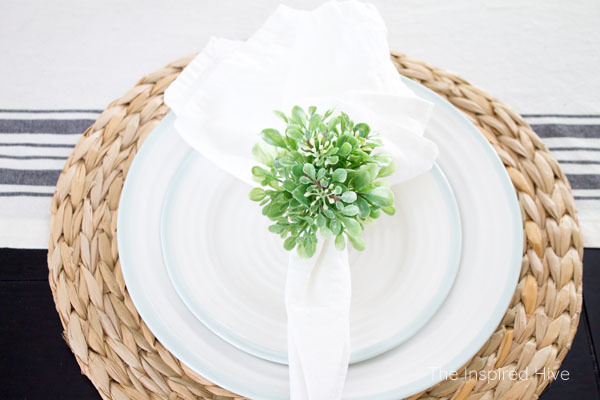 I love that they are classic and timeless and have a touch of my favorite color with the celadon rim. They are easy to dress up or down for any occasion. We use them on a daily basis. I also own most of the solid celadon entertaining dishes and a few of the white pieces as well. I hope to eventually build some sort of display for my growing collection! 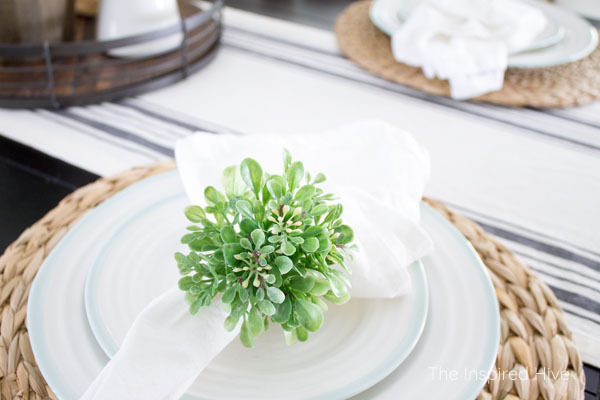 Those sweet little boxwood napkin rings were a Christmas gift from my good friend Erica from the blog Dwell Beautiful. This dresser once held our coffee bar in the old house. 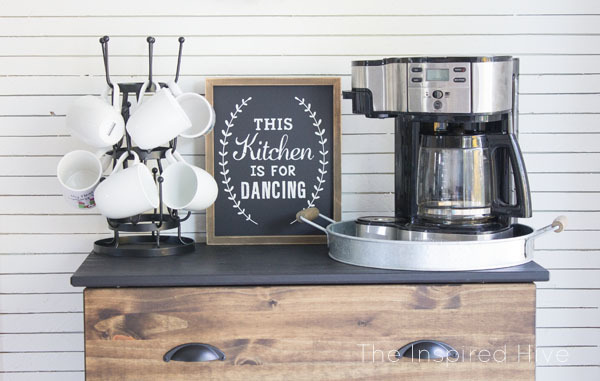 I'm not sold on keeping it in this spot, but this wall needed something, and this dresser adds a lot of contrast to the space with it's wood stain and black top. 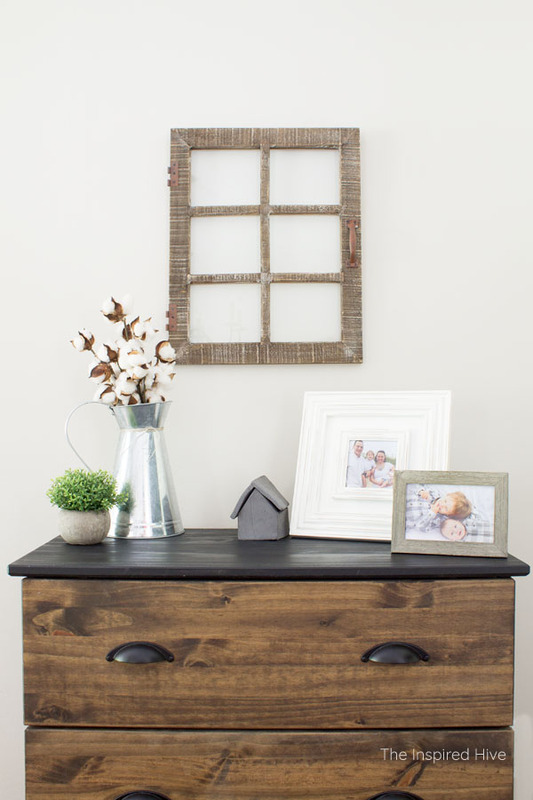 You can find the tutorial for how I turned a plain Ikea dresser into this beauty here. Someday I plan to put a big beautiful barn door on this wall (the doorway to the living room is just to the left and overflowing with toys, so I'll save that for another day 😉 ). 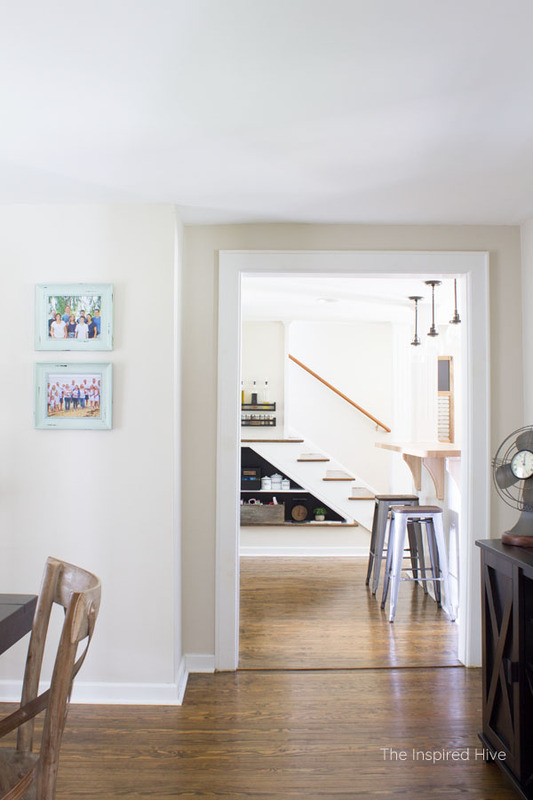 And even further down the line, I think I would like to remove this wall altogether so that I can see the kids playing from the kitchen on the other side of the dining room. 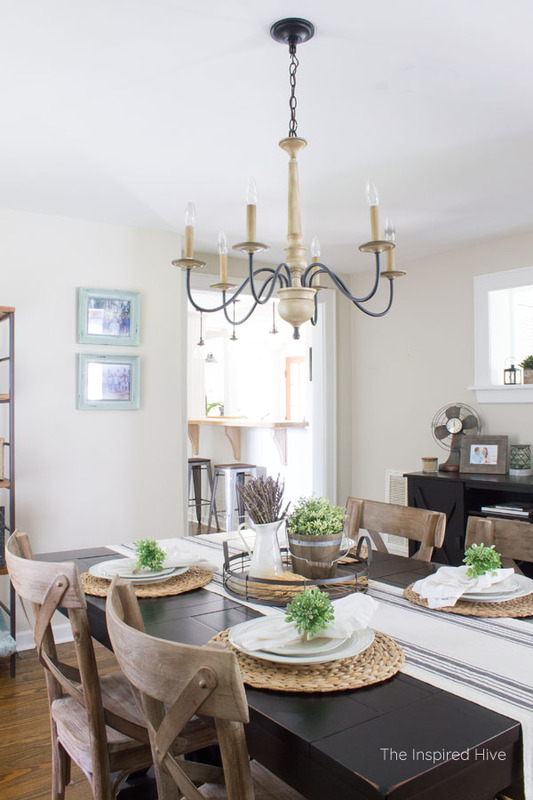 I always feel so torn about these kinds of renovations because they take away a bit of the old farmhouse charm and how the rooms were originally intended, but in some cases, function has to trump preservation, so we'll see. On the other side of the room, the industrial bookshelf from the guestroom in our old house holds some decorative items. I added just a touch of my favorite color tone with those minty distressed frames on the wall. To the right, there is a window into the mudroom. That room will be the next BIG project we tackle, so I can't wait to share it with you. My old credenza fits perfectly under that awkward window and holds all of our china and entertaining dishes. We used to have black chairs that came with the dining table as a set, but they made this room feel even darker. Swapping them out for these graywashed bistro chairs really lightened things up and helped balance the black and wood tones. It also helped anchor and highlight the table. From the dining room, you can also see into the kitchen a little bit. I recently gave that little cubby under the stairs a makeover. Hidden to the left of that is our future coffee bar which I can't wait to share with you very soon! 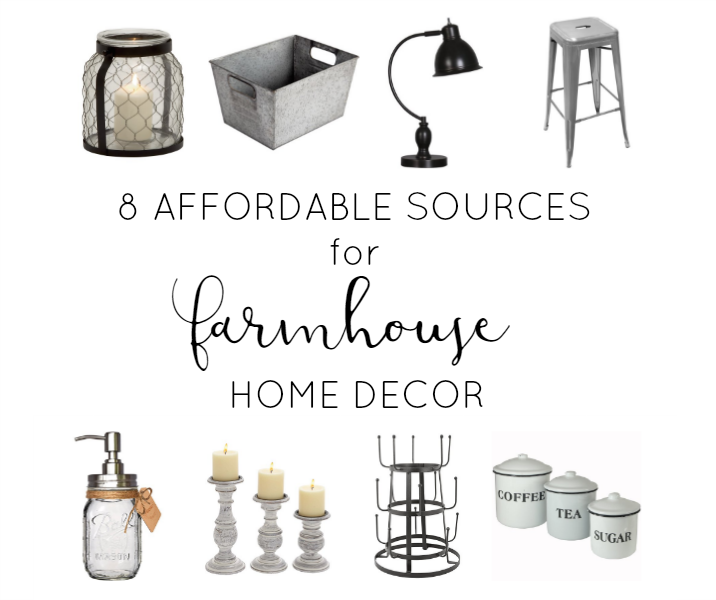 If you are interested in any of the items I used to decorate this space, you can find them below. Future plans in this space? 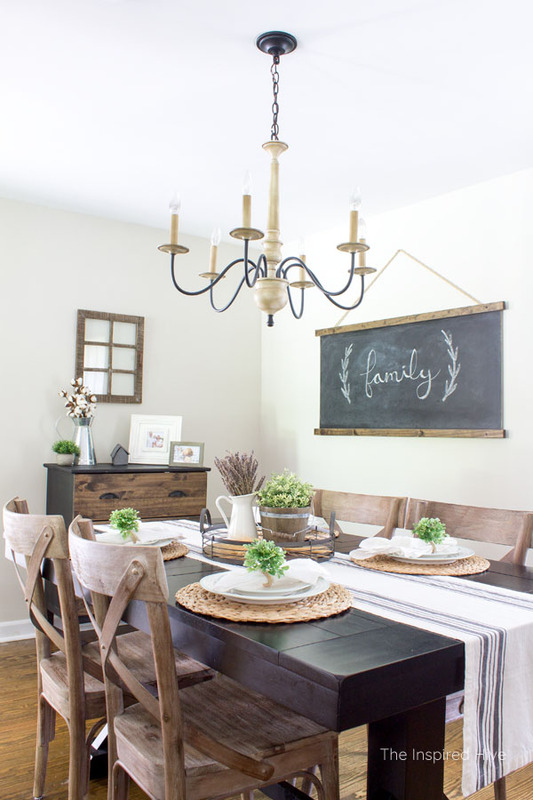 I think I would like to add shiplap to the wall holding the chalkboard. Some say it is going out of style, but when you live in a house that actually has "shiplap" lying behind the walls, I think it's safe to say it fits the time period of the home. I would also love to add a barn door leading to the living room, as I mentioned above. The only other thing I feel the space is missing is a rug. I'm on the hunt for the perfect kid friendly rug that's easy to clean food off of but still has a little farmhouse style. If you've got one, let me know where you got it!